In 2014 I plan to walk parts of the Great Wall of China to raise money for the British Lung Foundation (BLF), a charity that works hard to raise the voice of people living with lung diseases. In my day job I lead an integrated respiratory team supporting mainly COPD patients across home and hospital. 2013 was an amazing year for me with the highlight of winning the RCN / Nursing Standard Nurse of the Year Award. This was a very proud moment for me that will echo throughout the rest of my nursing career. As I embarked on my journey as Nurse of the Year I was lucky enough to be able to meet so many inspiring people such as Baroness Aubrey and the CNO Jane Cummings as well as many many nurses all of who remain so positive in such difficult times. As 2014 approached I wanted to support a charity that is very important to my professional work. I wanted to raise the profile of the BLF as well as raise money for a charity that my team and I frequently refer to in everyday practice. We give out their information leaflets to patients on a number of respiratory conditions and value their advice and support in developing research and new ideas on tackling respiratory disease. 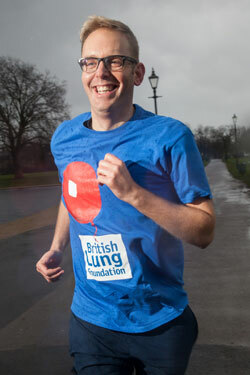 The BLF is the only charity that works to improve the lives of people affected by lung disease right across the UK. The burden of lung disease continues to be a growing cause for concern. Over half of respiratory deaths are due to lung cancer or COPD and are linked to smoking, with breathlessness the 'silent symptom' one of the commonest indicators. My team have raised money for the BLF in the past through community awareness events and team sports days etc. Patients have always given such positive feedback about their interaction with the BLF that I wanted to do 'something special' and give a little back and this trek felt like a great opportunity to do this. Why the Great Wall of China? I ask myself the same question as I venture out for my daily run, often in the pouring rain! Although I enjoy running I didn't want to undertake a marathon so I thought I'd try a different challenge that would also test how my own lungs would work! The wall's altitude prompted me to wonder how it would really feel to be at such height and experience breathlessness undertaking normal activity such as walking, something many of us take for granted. I also thought I could monitor my oxygen levels and so, with parts of the Great Wall of China as high as 980m above sea-level, this seemed on paper like a good challenge. I signed up and that's where my story starts. One of the other main things I have been doing since winning Nurse of the Year is promoting the Chief Nursing Officer's 6Cs and highlighting positive news stories around nursing. So my pledge is focused around my own 6Cs: China, Challenge, for COPD with Commitment, Courage and Compassion. I hope the nursing community will get behind me to spread the word and help raise awareness about my trek. I need your help to raise as much money as I can for this incredible charity. I have set-up a Virgin Money Giving page, and I would like to thank everyone in advance for their support - watch this space for regular updates.